Show that special someone you love them with these heart-shaped tokens of affection. It’s important to beat the mixture until it’s very thick; this will ensure that the marshmallows set properly. 1. Add the castor sugar, glucose and 190ml of the water to a heavy-based saucepan. Add the remaining 190ml water to the gelatine in a small heat-proof dish and leave it to stand for approximately 10 minutes. Place the dish containing the gelatine in a small saucepan containing boiling water and stir the gelatine until runny. 2. Stir the sugar mixture over a low heat until completely dissolved, then bring the syrup to the boil and boil it, without stirring, until it reaches hardball stage (120ºC on a sugar thermometer). Add the dissolved gelatine to the syrup but be careful as it will sizzle and spit. 3. Use an electric beater to beat the egg whites until stiff. Slowly add the syrup to the egg whites, beating continuously. 4. Add the rosewater and colouring and beat until the mixture is thick and retains its shape. Combine the icing sugar and cornflour and sprinkle into a 20 x 30 x 3cm dish. Pour the marshmallow mixture into the dish, smooth the top and leave to stand for 2 hours. Set the remaining icing sugar mixture aside. 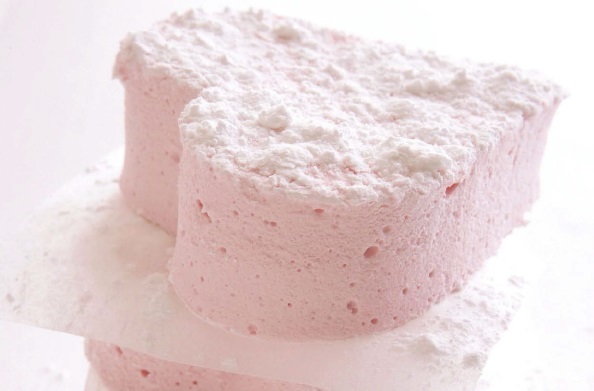 marshmallow mixture. Cut out shapes or blocks and roll them in the icing sugar mixture. Allow to dry for an hour before serving. The marshmallows will last for up to a week in an airtight container.